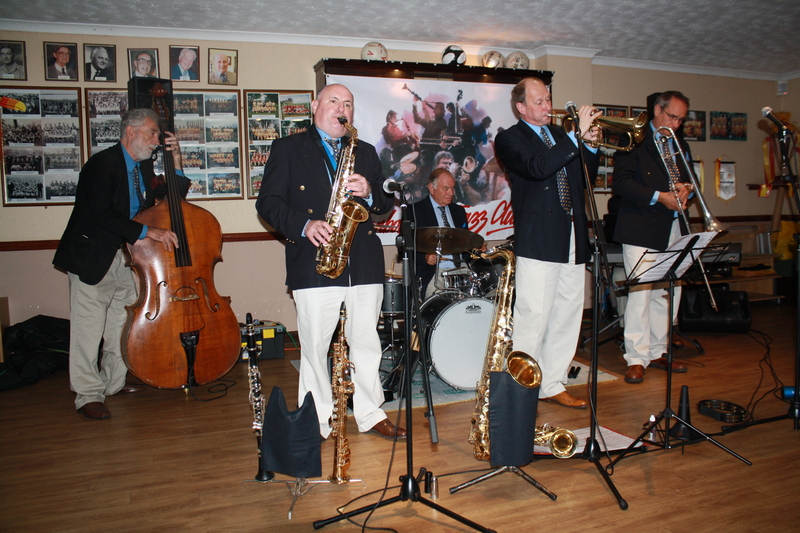 STORYVILLE JASSBAND from Holland gave us a wonderful evening on 28th August 2015 at our Farnborough Jazz Club. Last time they were here, they ‘brought the house down’. That was back in April 2013. This Friday, was every bit as good. 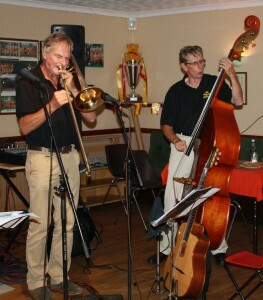 Their leader and cornet player then, was Ruud Nieuwenhuijzen. 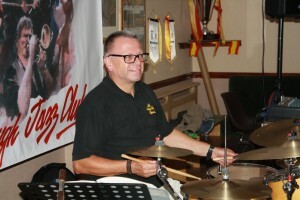 Unfortunately he is ill with ALS and is unable to play with the band from now on. 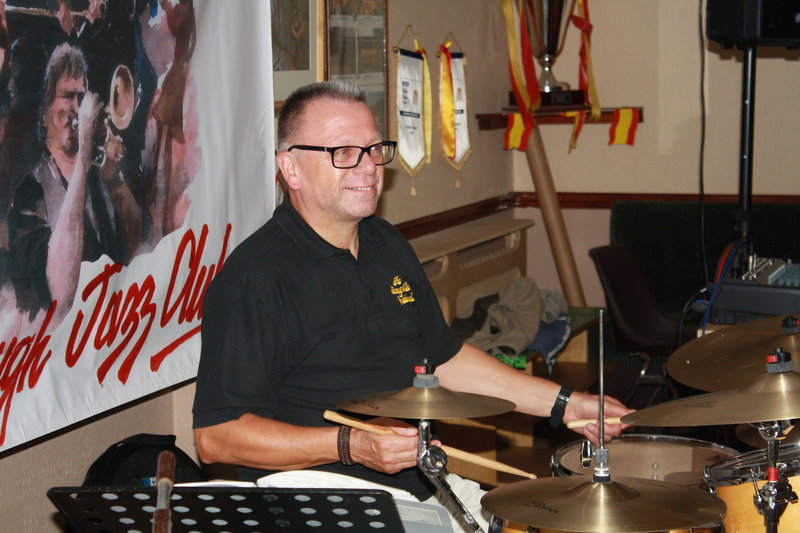 This brilliant optimist, his wife Paula and two friends were at the gig, to support the band. Ruud is a fantastic man and replaced himself – most would have done so with a lesser player – ha, but not him – he found a great cornet player, namely PETER VAN DE GEIJN. Peter was joined by HENK VAN DE VEN on clarinet, PETER DOBBE on trombone, vocals & guitar, BERRY SCHUURING on drums, HEIN VAN ROOIJEN on double bass and HENK VAN MULLIGEN on banjo & guitar. 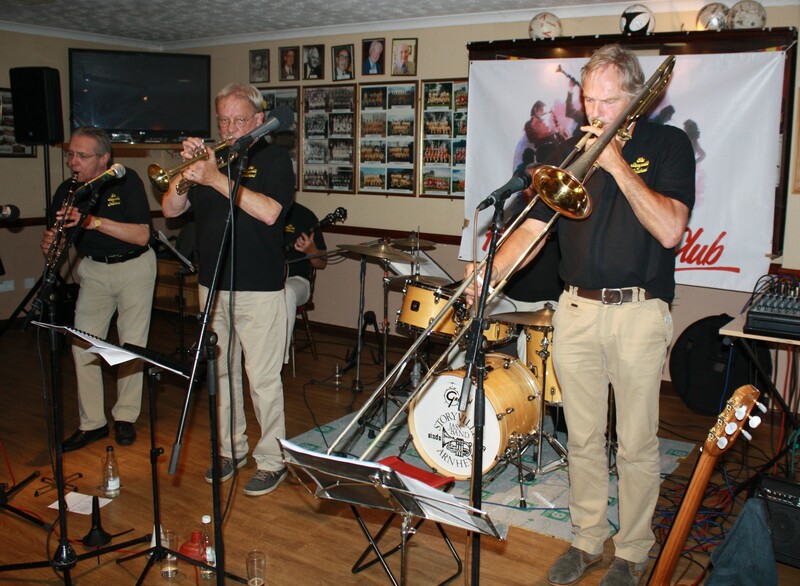 Storyville Jassband from Holland with Henk Van De Ven (clarinet), Peter Van De GeIin (cornet) & Peter Dobbe (trombone) at Farnborough Jazz Club, Kent UK on 28th August 2015. Photo by Mike Witt. 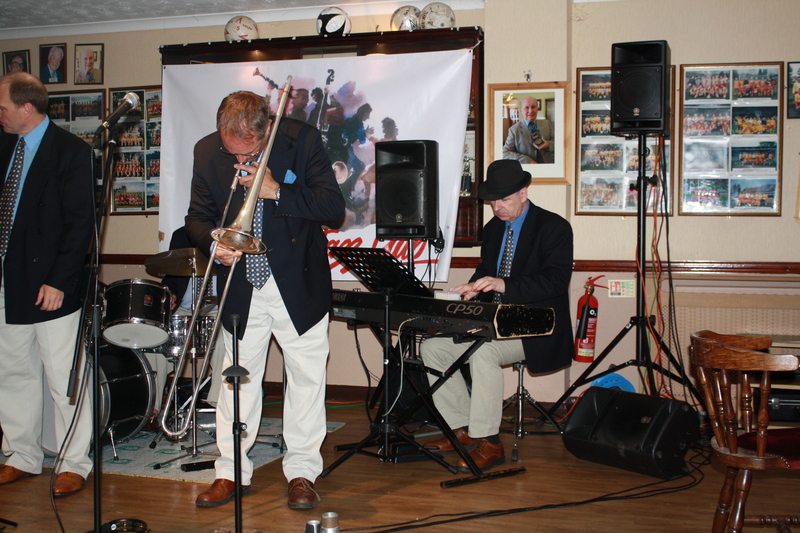 Storyville Jassband, PETER DOBBE (trombone) & HEIN VAN ROOIJEN (double bass) at Farnborough Jazz Club, Kent UK 28aug2015. Photo by Mike Witt. It certainly was another top quality treat for you. I was having such a great time myself, so again I had trouble writing my notes – but here goes. My first note is of the Gershwin boys number, ‘The Man I Love’, featuring Peter (D) on trombone – fabulous. 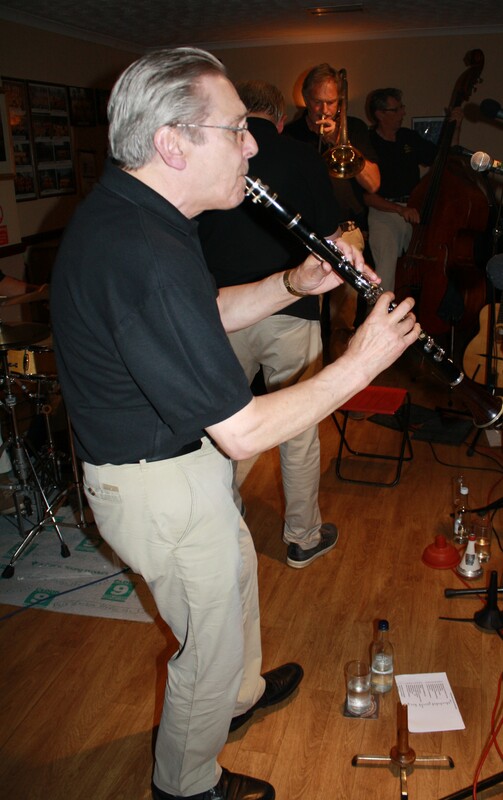 Storyville Jassband from Holland with Henk Van De Ven (clarinet) at Farnborough Jazz Club, Kent UK on 28th August 2015. Photo by Mike Witt. 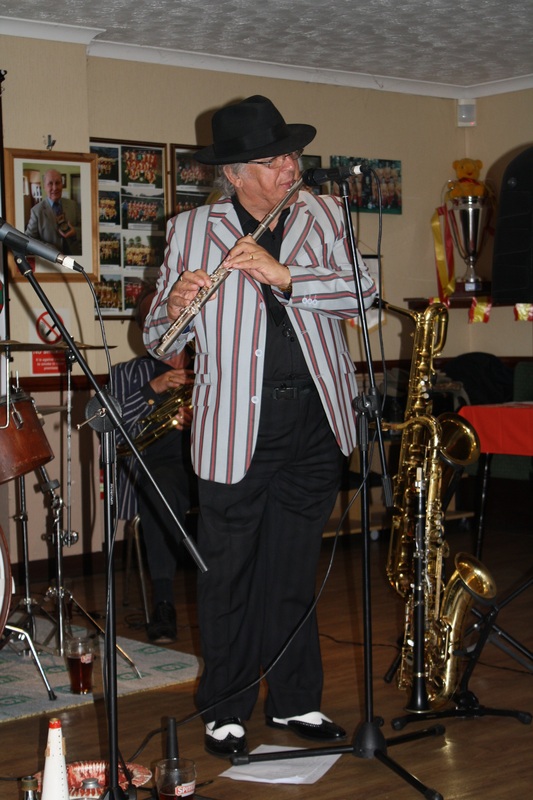 Followed on with another feature for Henk on clarinet, called ‘Summer Set’ (the number Acker Bilk wrote for his daughter). Next, I jotted down Henk’s performance of Django Reinhardt’s ‘Nuage’, a hard act to follow, but Peter (D) managed easily, singing ‘Doin’ the New Low-Down’, vocally backed by all of them (what singing – great). ‘Why Should I Hesitate’ was brilliant with Peter (Van D.G) playing Louis Armstrong style, plus Peter (D) again singing – what a lovely number. We enjoyed our Charleston-style line-dance when they played ‘St. Philip Street Breakdown’. 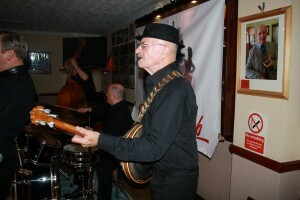 Storyville Jassband, HENK VAN MULLIGEN (banjo) at Farnborough Jazz Club, Kent UK 28Aug2015. Photo by Mike Witt. 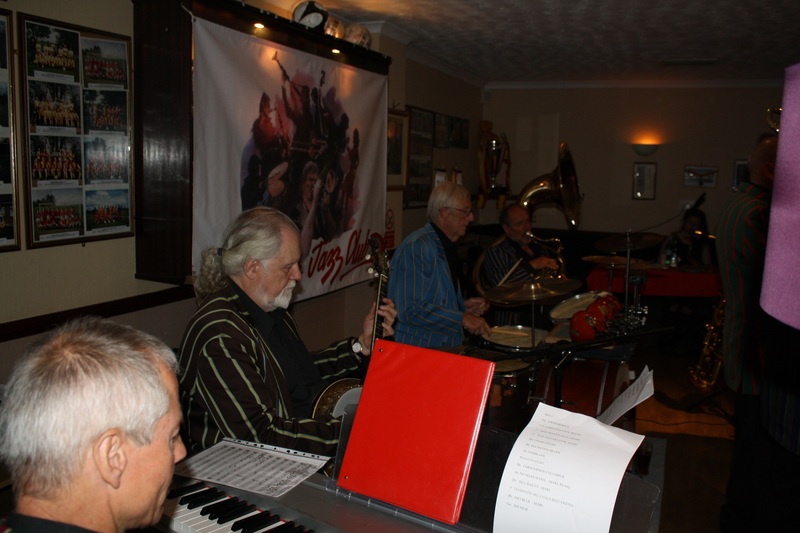 Storyville Jassband from Holland with BERRY SCHUURING (drums) at Farnborough Jazz Club, Kent UK on 28th August 2015. Photo by Mike Witt. Then we had a real treat watching a lovely couple (Jane and Alan) who are fantastic dancers, visiting from the Hastings 1066 Jazz club. They danced to the band’s brilliant performance of ‘Running Wild’. 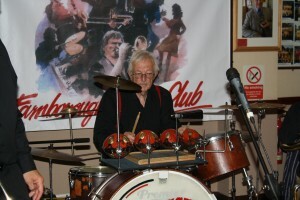 Berry gave a super drum solo (yes, Jane and Alan kept up with him too). Their last number was spectacular as it involved three numbers in one! (I had a hard job writing the names down as was busy dancing, but Ruud has since helped me with them). The first piece was ‘Joseph, Joseph’ (with Henk Ven leading on clarinet), the second piece was Edith Piaf’s ‘Padam padam’ and third piece was Kenny Ball’s ‘I Still Love You All’. Very impressive and certainly completed a fabulous evening with a great bunch of guys from Holland. We hope they will be back to us another year. Meanwhile, our very best wishes and love go to Ruud and Paula. ‘Keep your peckers up’. 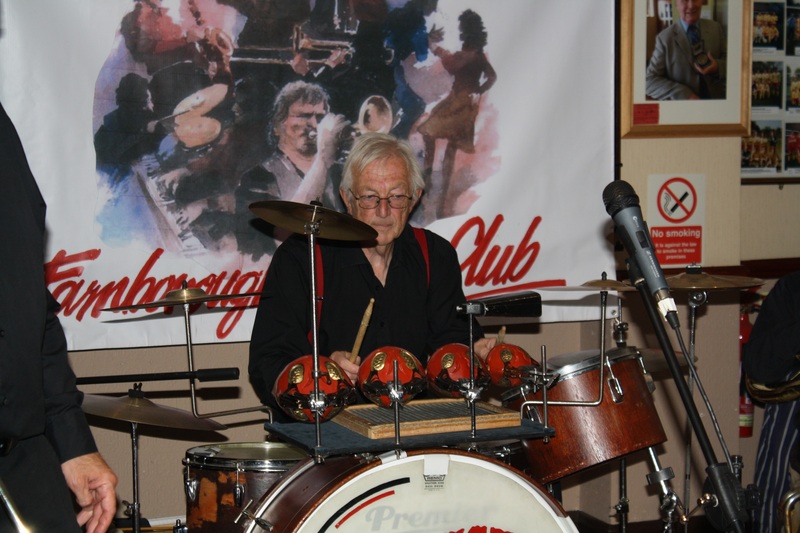 This entry was posted in Storyville Jassband (Holland) on August 30, 2015 by Diane. MARDI GRAS JAZZBAND! This was the band who had the tough job of following on from our two special Friday celebrations. Well, I said they would certainly be able to fill that role and I told you that should you not believe me, then you must turn up and see/hear for yourselves. That was Friday, 21st August 2015. 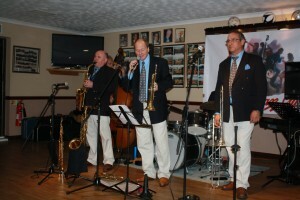 You all knew it was here at our Farnborough Jazz Club (Kent), because you did turn up. 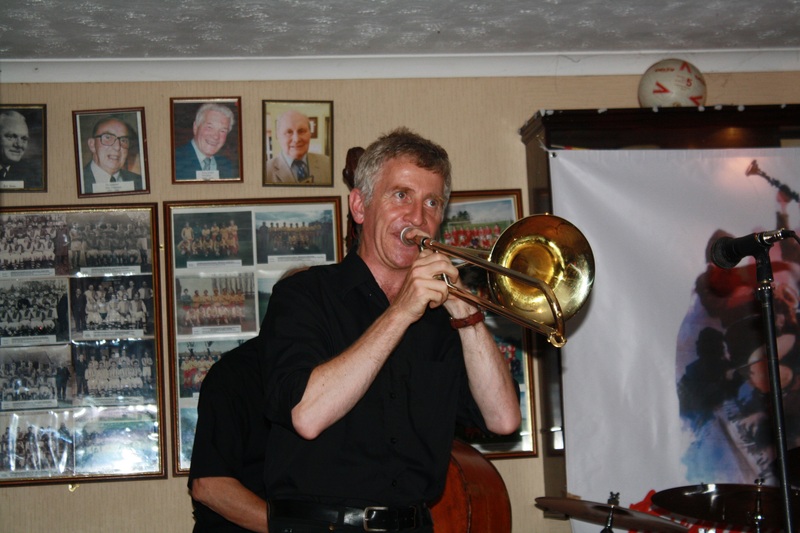 The band’s leader, trombonist ROB PEARCE, was joined as usual, by LEIGH HENSON on trumpet &vocals, JOHN ELLMER on reeds (John played drums here last week), TIM HUSKISSON on piano, BRIAN BELL on drums and DAVE SILK on double bass &tuba. I reminded you of the last couple of times they played for us, how you didn’t want them to end, so they were certainly back again by popular demand. How do I tell you just how great they were, well you really should be here on nights like this. 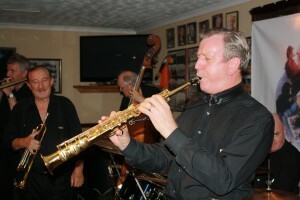 Mardi Gras Jazz Band at Farnborough Jazz Club on 21August2015. 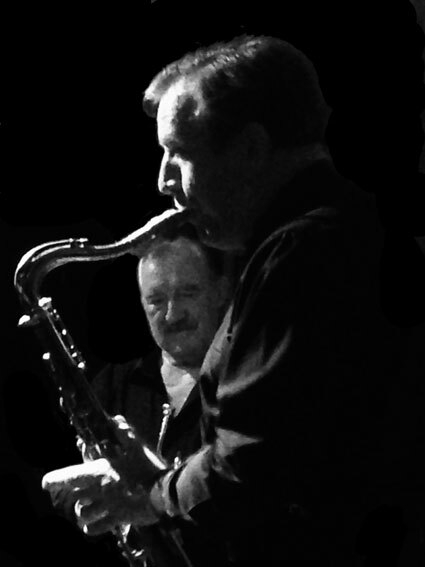 (LtoR) John Ellmer on alto sax, with Leigh Henson singing and Rob Pierce on trombone . Photo by Mike Witt. Ok, here goes … the first number was sung by Rob and was ‘If I had You’, with John giving a touch of ‘007’ flavour to it – smashing. Leigh sang ‘I’ve Gotta Right To Sing the Blues’ and yes – he’s got a great voice too. My next starter for ten ‘Don’t Get Around Much Anymore’ was wonderful. John played tenor sax and how they all excelled. Mardi Gras Jazz Band at Farnborough Jazz Club on 21st August 2015. (LtoR) Dave Silk on d.bass, John Ellmer on alto sax, Brian Bell on drums, Leigh Henson on trumpet, Rob Pierce on trombone and (not pictured) Tim Husskison on piano. Photo by Mike Witt. The next number I wish to comment on was that Duke Ellington number ‘It Don’t Mean a Thing (If You Aint Got that Swing)’, was sung by Leigh. Oh, it was just brilliant. I had written ‘great trumpet, great bass and great drums’ – well, they were all fabulous, but I’m getting so repetitive – sorry, can’t help it! Then we come to a Louis number, ‘Swing that Music’, oh boy, oh boy, great stuff. We performed our line dance to my next choice ‘Some Of These Days’, a lovely samba. Then snakes alive, Keith actually asked me to dance and he was fabulous too – ha. The dance? To ‘Panama Rag’, wonderful. My last mention must be ‘Frim Fram Sauce’ of Nat King Cole fame. I don’t recall it having been played here before and just loved it (but then I am a Nat King Cole fan, big time). 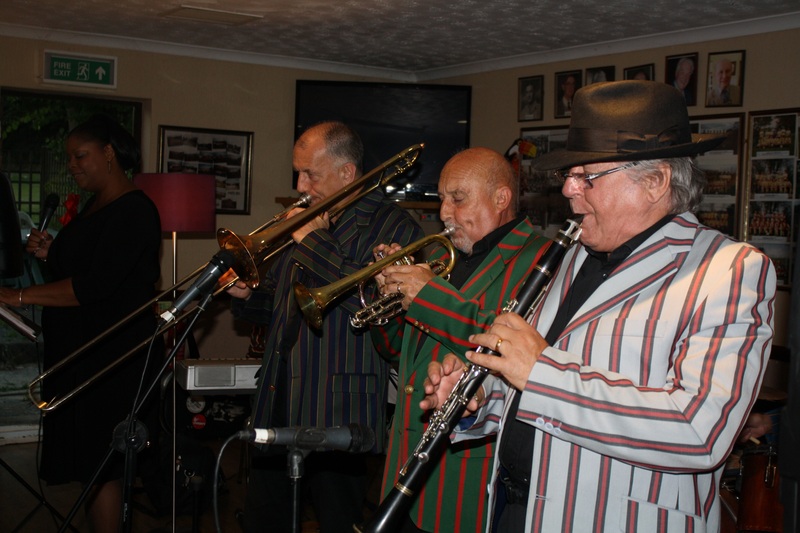 Mardi Gras JazzBand at Farnborough Jazz Club on 21st August 2016. (LtoR) Leigh Henson (trumpet), Rob Pierce (trombone) and Tim Huskisson (piano). Photo by Mike Witt. Mardi Gras, we just love you and love seeing you enjoy playing together. Bookings will be on-going, we hope. See you back here 20th November 2015. 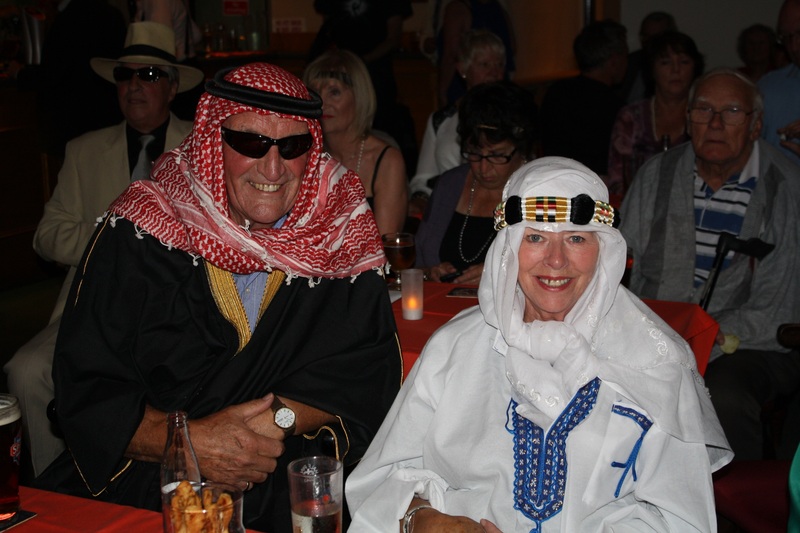 This entry was posted in Mardi Gras JazzBand on August 24, 2015 by Diane. Oh yes, it was certainly another exciting party on FRIDAY, 14th August 2015 at our FARNBOROUGH JAZZ CLUB with TONY PITT’S ALL STARS. It was Keith’s second celebratory birthday ‘do’. Last week was a practice run (and oh boy, what a practice), his birthday was actually on the glorious 12th and this Friday was booked ‘because he had made it’! TONY (banjo), gave Keith a brilliant present by obtaining fab stars DENNY ILETT on trumpet, GRAHAM HUGHES on trombone, AL NICHOLLS on saxes, ANDY LAWRENCE on double bass and JOHN ELLMER on drums to play for him – and of course, all of us. 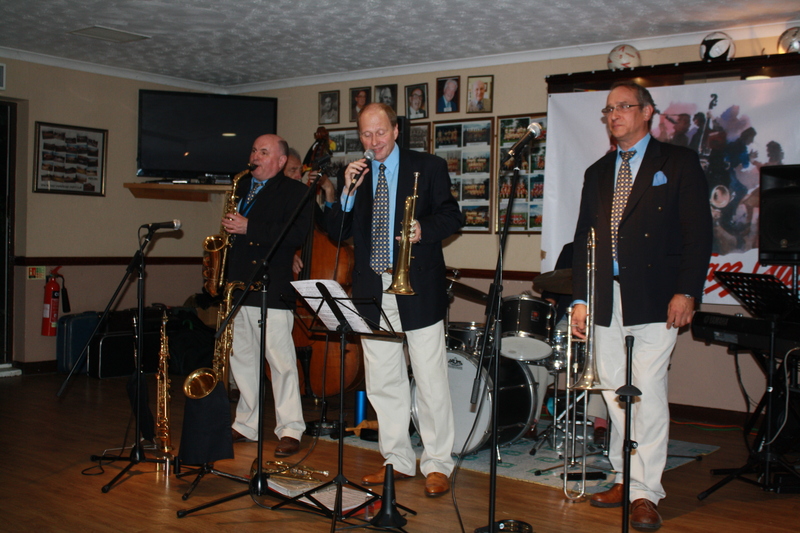 Tony Pitt’s All Stars played on our second celebration for Keith’s Special birthday at the Farnborough Jazz Club, on 14 August 2015. Photo by Mike Witt. I said it would be a humdinger of an evening and it definitely was. You will have to take my word for it, the evening was (just like last week), well actually, words cant describe just how terrific it was, although I will try. Obviously, the beginning of the evening was busy for me, with so many people arriving, wanting to join in with making Keith’s party go with a swing. A few numbers had been played before my first chosen number, ‘Blues My Naughty Sweetie’, however, what a number. I had written “fabulous”, an asterisk and two ticks (to make sure I chose the number) and had also noted Al was brilliant on soprano sax. I also wrote “drums – Denny – oh everyone”!!!! Then came ‘Tishamingo Blues’ (with Al using tenor). 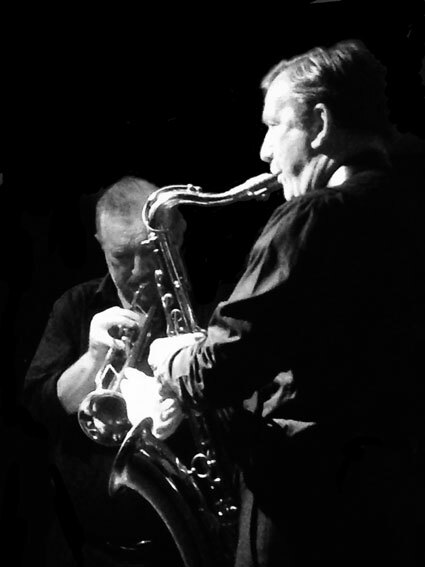 “JAZZ JIANTS” Al Nicholls (tenor) & Denny Ilett (trumpet) two of Tony Pitt’s All Stars at Keith’s special birthday, Farnborough Jazz Club on 14th August 2015. Photo by Chrissie Nicholls. “JAZZ JIANTS” Al Nicholls (on soprano) AND Denny Ilett (trumpet), two of Tony Pitt’s All Stars at Keith’s special birthday, Farnborough Jazz Club on 14th August 2015. Photo by Mike Witt. 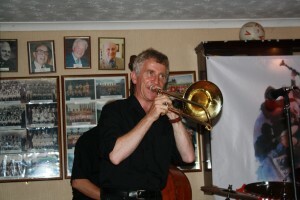 Graham Hughes (trombone), one of Tony Pitt’s All Stars at Keith’s special birthday at Farnborough Jazz Club, 14th August 2015. Photo by Mike Witt. The next number was ‘All of Me’ and must mention some super trombone playing from Graham, as well as great bass from Andy. Then Denny sang ‘When You and I Were Young, Maggie’, quite a favourite, with plenty of dancing (I’m sure I caught a bit of him singing ‘Lucile’). 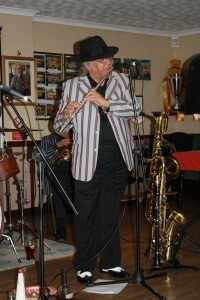 Denny was then featured with ‘Bad Penny Blues’, to which he performed his speciality – playing just the mouth piece (good golly miss molly – he sure is a beautiful trumpeter). Tony was fabulous on solo banjo too. ‘You Always Hurt The One You Love’ followed and Tony added some playing on the mouth organ – clever clogs. 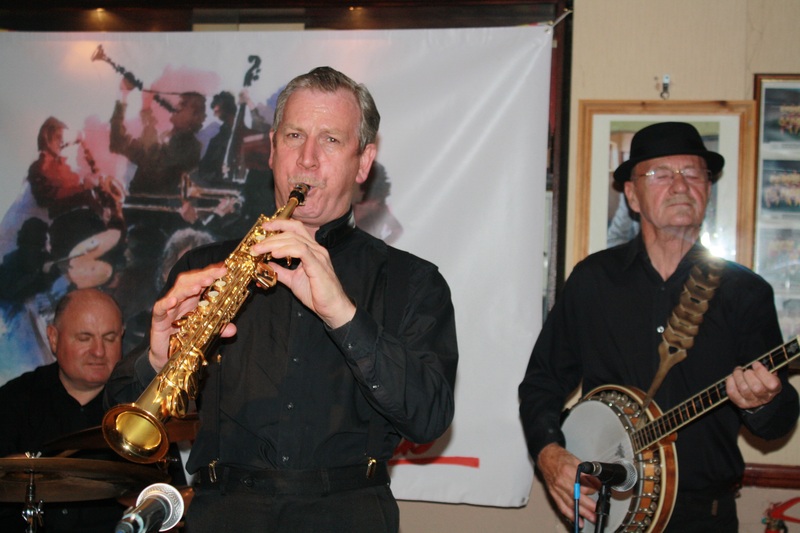 Then Graham sang ‘Way Down Yonder In New Orleans’ (with Al playing soprano sax), always brilliantly played. Next came Al, featured with ‘Lady Be Good’ Oh boy, what superb playing. Tony really knows how to pick ‘erm aye. 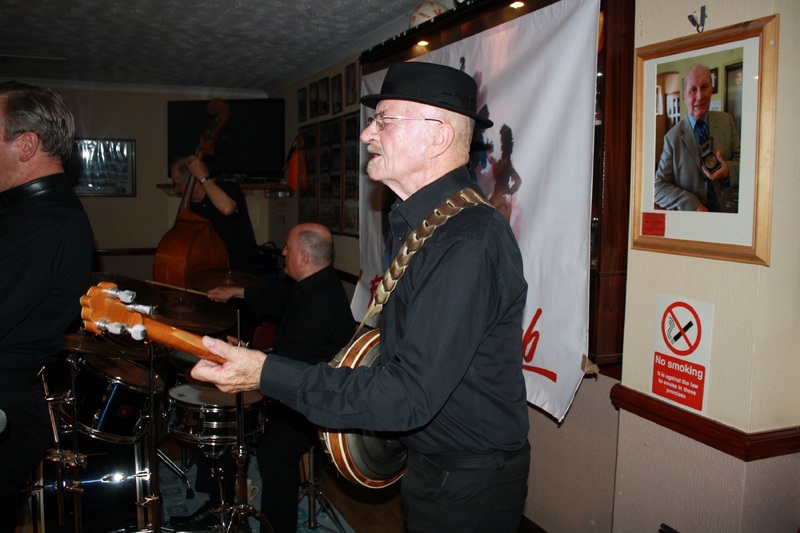 Tony Pitt’s All Stars (Tony on his hand-made banjo) at Keith’s special birthday, Farnborough Jazz Club 14th August 2015. Photo by Mike Witt. Tony then had them play his favourite number, ‘Blue Turning Grey Over You’. 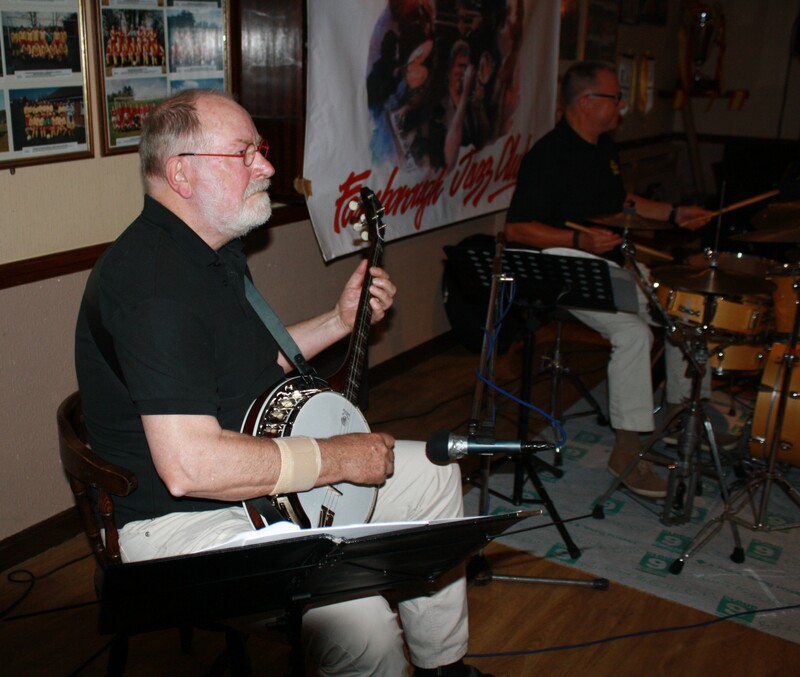 I was told Tony made this fabulous banjo himself, even inlaying his name on the ‘head’ – see photo showing this (yes Chrissie, he’s not just a pretty face). So another evening bites the dust – yes, a mind-blowingly good one too. We were once again so overwhelmed – so many smiling faces, of course no-one wanting it to end. Keith (and I) will always remember this birthday, that’s for sure – thanks boys (from both weeks). 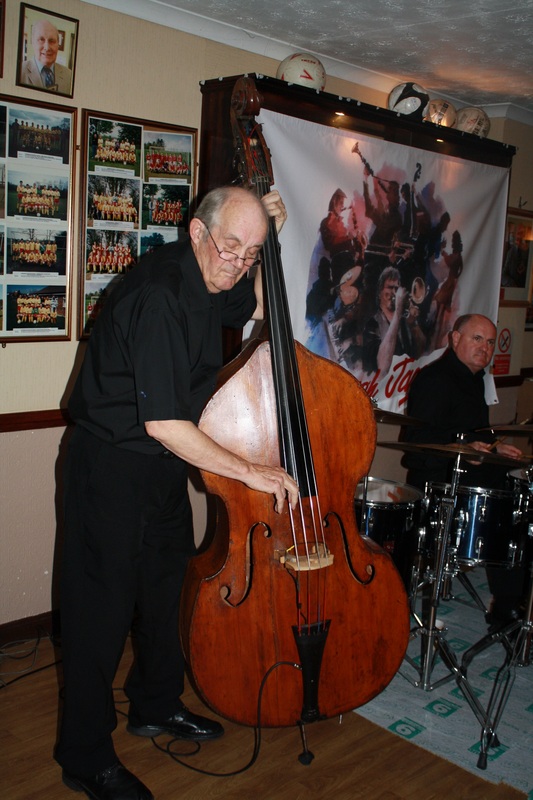 Andy Laurence (d.bass) one of Tony Pitt’s All Stars at Keith’s special birthday, Farnborough Jazz Club on 14th August 2015. Photo by Mike Witt. 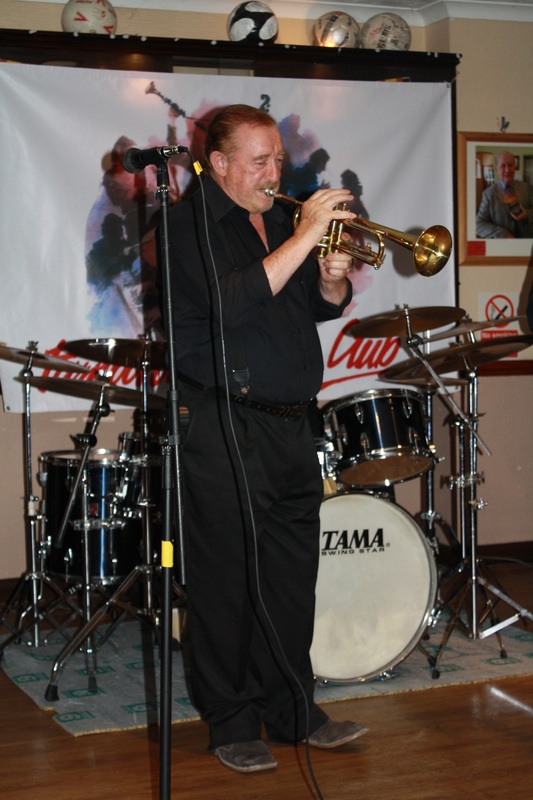 Denny Ilett (trumprt) one of Tony Pitt’s All Stars at Keith’s special birthday, Farnborough Jazz Club on 14th August 2015. Photo by Mike Witt. 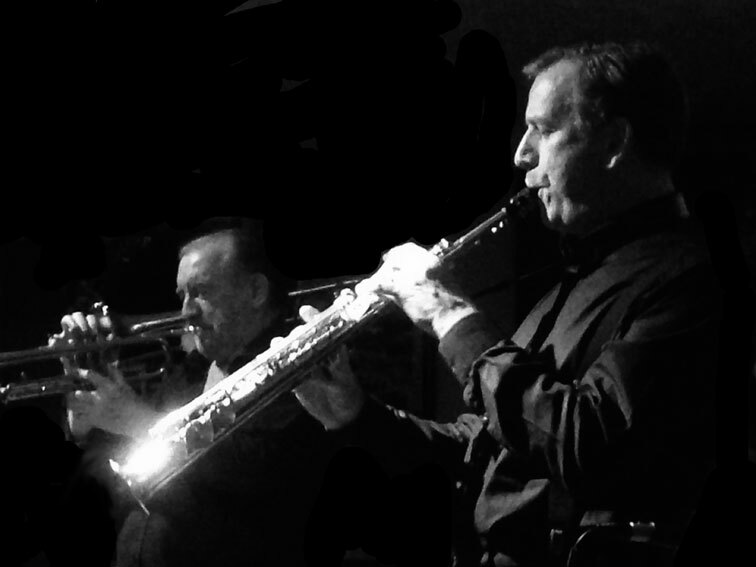 Our Jazz Jiants Denny Ilett (trumpet) & Al Nicholls (tenor) (Keith’s special birthday) at Farnborough Jazz Club, 14th August 2015. Photo by Chrissie Nicholls. Tony Pitt’s All Stars showing Al Nicholls (tenor & soprano saxes) and Denny Ilett (trumpet) (Designed & photos taken by Chrissie Nicholls) at Farnborough Jazz Club 14th August 2015. Al Nicholls (alto) and Denny Ilett (trumpet), two of Tony Pitt’s All Stars, playing for Keith’s special birthday at Farnborough Jazz Club on 14th August 2015. Photo by Chrissie Nicholls. 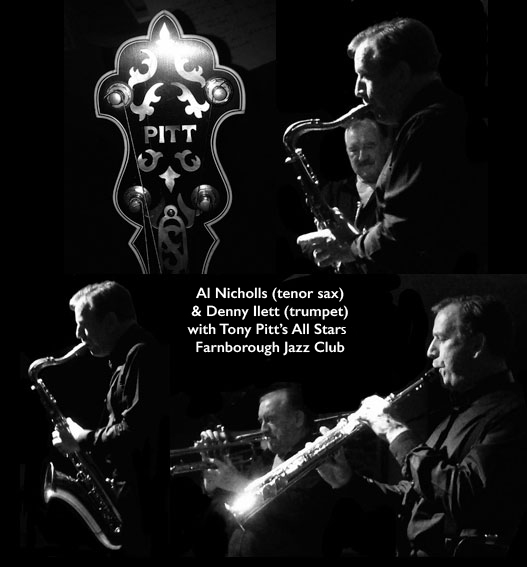 Al Nicholls (tenor sax) a star of Tony Pitt’s All Stars for Keith’s special birthday, Farnborough Jazz Club, 14th August 2015. Photo by Chrissie Nicholls. There are far more photos than usual, but couldn’t leave any out – too good. However, I am requesting if any of you took some pics of Keith, I would love to receive them please. Plus if they are good enough, would also use on the website. with your permission – your name would be added (or not if you so prefer). Thanks. This entry was posted in Tony Pitt's All Stars on August 17, 2015 by Diane. We promised you would have some fun with HARRY STRUTTERS HOT SEVEN who were to be our treat for Friday, 7th August 2015. They were the first of two celebrations for Keith’s birthday and we certainly did not disappoint you, did we! 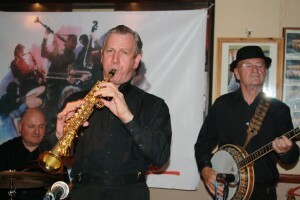 The band leader, MAURICE DENNIS (banjo/guitarist) had with him MARTIN LITTON (piano), MIKE ‘MEGS’ ETHERINGTON (trumpet/vocals), reeds), PAUL TAYLOR (trombone), ALLAN SOKELL (sousaphone) and GRAHAM COLLICOTT (drums). At the last minute, Maurice phoned to say they were bringing a singer. As if this band was not enough, we had the beautiful and delightful young American vocalist, MARLENE HILL – wowie, she was lovely. 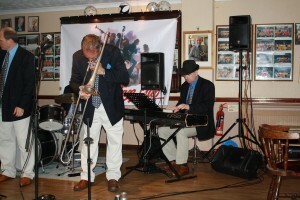 This was their first appearance at the FARNBOROUGH JAZZ CLUB. They usually play as an orchestra in theatres across the Country. When I booked them, I had tried hard to keep it between the band, myself and my immediate family. I had so wanted it to be a surprise for Keith, but he read the name of the band whilst I was typing an email to Maurice. Keith is a Luddite – hates computers and doesn’t particularly have that good an eyesight – I was stunned. As it happens, he had known Martin since he was a young m–an, playing piano just for drinks, at the Steering Wheel Club (the club Keith had run with David Capstick). So for that reason, Keith’s eyes had picked up quickly! Anyway, my surprise was now out of the bag. The evening also had a couple of other birthdays, namely June’s (pictured) and Mike Witt the other, some celebrating was definitely the order of the evening. 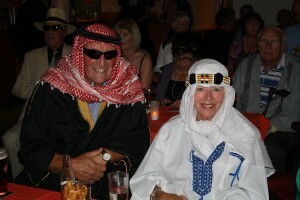 We had asked for fancy dress 1920’s/30’s dress style and wow, you certainly made an effort and did us proud. I should also mention the band were brilliantly dressed in style themselves (striped blazers). I was so busy greeting everyone on arrival, plus having too good a time myself and unable to list numbers being played, but luckily, they gave me a list they might play, so I was able to make my remarks. I had chosen so many numbers to tell you about and had difficulty cutting down. I recall their first number was ‘S’ Wonderful’, a great number to kick-start us off immediately. I’ve skipped some fabulous songs by Marlene – Oh she was super – onto ‘The Charleston’, did our line-dance here, with so many joining in. Then must mention ‘Jambalaya’, which was super to dance to. One of my all-time favourites, ‘Christopher Columbus’ – mind-boggling good. Now we come to Marlene. She was featured next with her wonderful rendition of ‘No Mans Mama’. 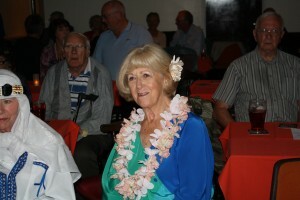 What a brilliant voice and she’s looks good too …spit… Next came another line-dance (we did three!) this time to ‘Bill Bailey’. Wow, this was powerfully sung by Marlene, what an exciting singer! The next number was sung by ‘Megs’ (so many great singers around today) and he sang to that popular number ‘Bei Mir Bist Du Shon’, with everyone performing some brilliant solos (trumpet muted with bowler hat) Next up was to feature super Martin on piano – who was absolutely fab-u-lous, playing ‘Dream a Little Dream’. I have to mention ‘Mr Sandman’, because Keith actually danced with me!!!! Well it was his birthday! And my last choice of number is one Keith and I often harmonise to one-another (ah, how romantic) ‘It Don’t Mean a Thing (if it Aint Got That Swing)’, s’ wonderful. 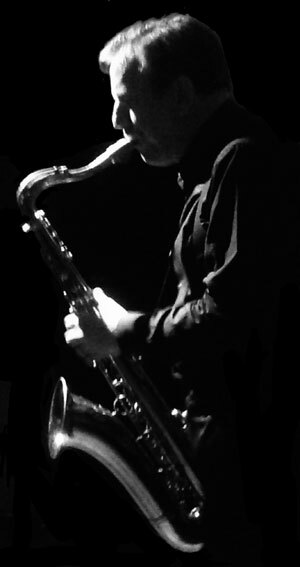 Oh, and I must mention, Keith added a couple of his limited edition jazz studies to the raffle as a ‘thank you’ to complete an absolutely brilliant evening (great photos are at the end). Thanks HARRY STRUTTERS HOT SEVEN. 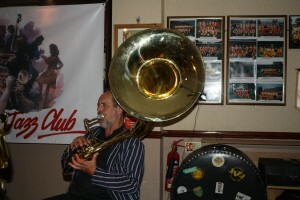 ‘Engine’ of Harry Strutters Hot Seven – Martin Litton (piano), Maurice Dennis (banjo), Graham Collicott (drums), Allan Sokell (sousaphone) at Farnborough Jazz Club on 7th August 2015. Photo by Mike Witt (his birthday too). 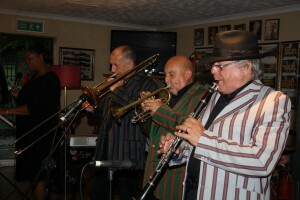 Front line of Harry Strutters Hot Seven – Marlene Hill (vocs), Paul Taylor (trmb), Mike ‘Megs’ Etherington (trmpt&vocs) and Tony Carter (reeds&vocs), at Farnborough Jazz Club on 7th August 2015. Photo by Mike Witt (his birthday too). Tony Carter (clarinet), Harry Strutters Hot Seven for Keith’s special birthday, Farnborough Jazz Club, 7th August 2015. Photo by Mike Witt (his birthday too. 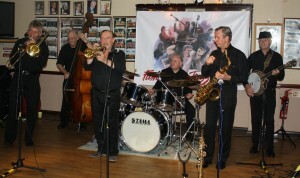 Harry Strutters Hot Seven at Farnborough Jazz Club, 7th August 2015. 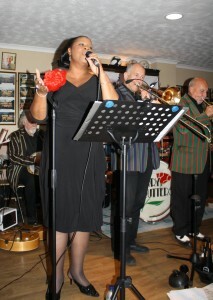 (LtoR) Maurice Dennis (banjo), Marlene Hill (vocals), Paul Taylor (trombone) and Mike ‘Megs’ Etherington (trumpet). Photo by Mike Witt (his birthday too. Harry Strutters Hot Seven at Farnborough Jazz Club, celebrating Keith’s special birthday party. (LtoR) Tony Carter (reeds&vocs), Martin Litton (piano), Maurice Dennis (banjo), Graham Collicott (drums) & Allan Sokell (sousaphone). 7th August 2015. Photo by Jill Alexander. 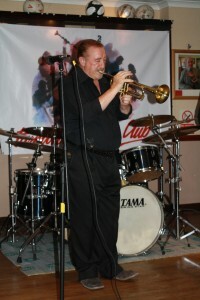 Graham Collicott with Harry Strutters Hot Seven at Farnborough Jazz Club for Keith’s special birthday, 7th August 2015. Photo by Mike Witt (his birthday too). Allan Sokell (sousaphone) with Harry Strutters Hot Seven at Farnborough Jazz Club for Keith’s special birthday 7th August 2015. Photo by Mike Witt (his birthday too). Sandy & Len (behind them are John, Jackie, June (her birthday too) & Jeff- behind them, Trudie plus Linda & Richard) at Farnborough Jazz Club for Keith’s special birthday party with Harry Strutters Hot Seven, 7th August 2015 Photo by Mike Witt (his birthday too). 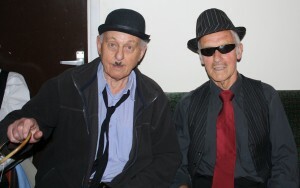 Steve & Gordon at Keith’s special party, Farnborough Jazz Club with Harry Strutters Hot Seven, 7th August 2015. Photo by Mike Witt (his birthday too). This entry was posted in Harry Strutters Hot Seven on August 10, 2015 by Diane.